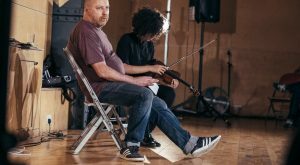 Two of the key figures in experimental music, composer Tim Parkinson and prepared violinist Angharad Davies, collaborate with director Jack McNamara to present a series of musical works that explore the crossover between theatre as sound and sound as theatre. Performed by artists at the forefront of modern composition and improvisation whose work interacts with time and space in an innately dramatic way, this is theatre for the ear and music for the eye…. With a title inspired by George S Trow’s influential essay about the decline of society in the new age, this is music theatre that removes the restrictions of ‘meaning’ or ‘context’ in an attempt to reach a purity of performance. The performance will be made of of a series of mind-bending, ear stretching works from some of the biggest names in avant garde music, including Louis D’Heudieres, Stefan Thut, Alison Knowles and John Cage. Each piece sits somewhere between music and theatre, forcing us to question the very foundations of either art form. These are works that play with the audience, with the players and with the very notion of what constitutes a performance. Special guest collaborators to be confirmed. Jack McNamara is artistic director of New Perspectives in Nottingham and also makes experimental work under Future Ruins. He has staged premieres by major international artists Lars Von Trier, Don DeLillo, Saul Bellow, Athol Fugard and David Rudkin. 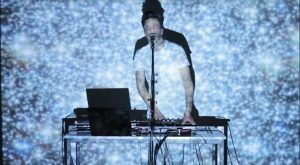 He has also created structured improvisations inspired by music, including Exterminating Angel (national tour) Malaise Trio (Camden People’s Theatre) and Theatre on a Long Thin Wire (Summerhall). Angharad Davies is a violinist, one at ease in both improvising and composition, with a wide discography as part of varied range of ensembles and groups. She’s a specialist in the art of ‘preparing’ her violin, adding objects or materials to it to extend its sound making properties. Her sensitivity to the sonic possibilities of musical situations and attentiveness to their shape and direction make her one of contemporary music’s most fascinating figures. 2015 has seen her being commissioned for a new work at the Counterflows Festival, Glasgow and premiering Eliane Radigueâ€™s new solo for violin, Occam XXI at the El Nicho Festival, Mexico.